Vaporization and evaporation are the reasons why water boils in a pot and why lawns need more frequent watering during the summer. Evaporation is one type of vaporization that occurs almost everywhere. Evaporation is much more common than the other kinds of vaporization, such as boiling. With vaporization, an element or compound transforms from a solid or liquid phase into a gas phase through the application of heat. This transformation occurs without changing the chemical composition of the substance. Evaporation is a type of vaporization that occurs when a liquid transforms into a gas while under the boiling point -- the temperature where water starts to boil. Evaporation plays a major role in the water cycle, where the sun causes water to evaporate and rise into the sky to form clouds, which eventually condense and release rain. Evaporation is limited since the liquid molecules that evaporate must be located at the surface of the water and must have enough kinetic energy to evaporate. High temperatures, low humidity and wind can increase evaporation. 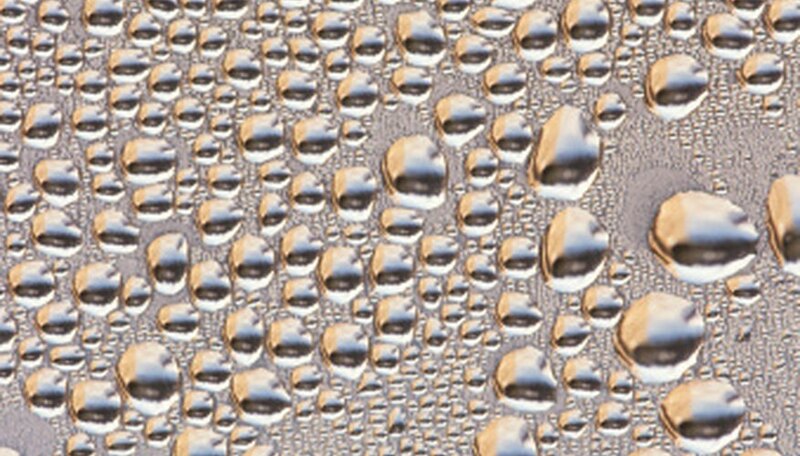 When the water has pressure exerted on it, the water evaporates more slowly because the pressure increases the water density. With evaporation, only the top level of water turns into a gas. With vaporization, all of the water can turn into gas. Rising heat often causes the water on the bottom to turn into gas and rise. Water has a force acting upon it to keep the water molecules together. Molecules on the surface are only constrained by the water molecules beneath them, so they are more able to overcome constraints that would hold down other molecules. However, with boiling, the water molecules have so much energy that they are moving fast enough to overcome the constraints placed on them by the other water molecules, causing the water to rise in gaseous form. In closed systems, such as a water bottle, water will only evaporate to a certain point. Some molecules evaporate and then touch the edges of the water bottle. Then, they condensate and fall back into the body of water. The vapor pressure increases in the water bottle until the pressure reaches a certain point that discourages further evaporation. If the water is instead boiled, the vapor pressure can become strong enough that it can cause the closed system to burst open if the system is not sturdy enough to resist the pressure. In a closed system, the water needs a higher temperature to get the gas pressure to reach the level of the surrounding temperature, causing the water to boil. The boiling point is based on the pressure of the gas surrounding the water. When the pressure of the evaporating gas produced by the water equals the pressure of the surrounding gas, the water starts to boil. Sublimation is another type of vaporization. Some solids will immediately turn into gases, without passing through the liquid stage. Sublimation usually occurs at very high temperatures, though some solids sublimate because they do not turn into liquid form except at high pressures. Robert, Chuck. "The Differences Between Vaporization & Evaporation." Sciencing, https://sciencing.com/differences-between-vaporization-evaporation-12052824.html. 25 April 2017. What Are Two Types of Vaporization?